← Dear Judge: life’s perfect with this parent & I don’t want any contact with the other one. A couple of comments. 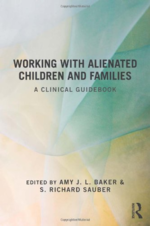 The reason given by the alienating parent for the child’s apparent lack of grief is of course that it is the child’s own choice to rid themselves of the alienated parent. This should be a dead give away that something is a miss, children of abusive parents still love and grieve for the loss of this parent, even if they know it is in their own best interest to have limited contact due to the abuse and/or neglect. Also the rejection of the extended family should raise serious concerns, if say dad really was abusive, why does the child now no longer wish to see the cousin they used to be so close to etc. 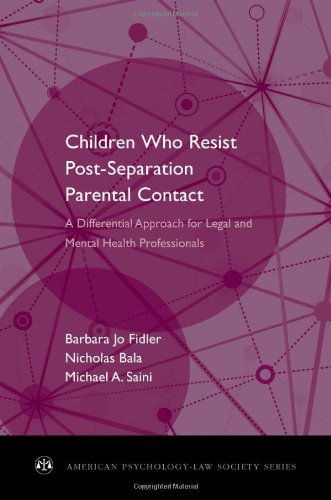 Likewise the alienating parent will often maintain that they are doing their very best to talk this child into having contact with the alienated parent. They try so very hard to make it happen and they just cannot because the child really does not want it. Again this is in stark constrast to all the other restrictions we put on children’s choices. Chocolate is not served at every meal to a toddler, you have to be a certain age before you can buy alcohol and learn to drive, school attendence etc. However, it is also an aim of our society to increase the choices of young people and children and to listen to and respect their wishes. We see it in school councils where children are actively encouraged to participate in decisions making processes and many other places too. This is of course to try to bring up children to become confident, capable of making desicions and independent. I wholeheartedly believe that this is important as long as the decisions the children are faced with are age appropriate. 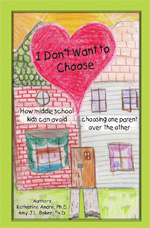 Asking a child to make the decision whether or not they want contact with a parent is not age appropriate. As adults we know how disadvantaged such children are, we cannot expect them to make decisions based on increased risk in their adult life of mental health problems and drug abuse – no child can understand and evaluate that kind of risk. Likewise should you ask teenagers about the level of contact they want to have with each parent? If both parents are supportive of the relationship with the other parent then fine have very flexible arrangements to suit the teenagers increasing engagement with friends and other activities. Both parents will take seriously their responsibility to ensure the this does not mean that the child looses contact with either parent. 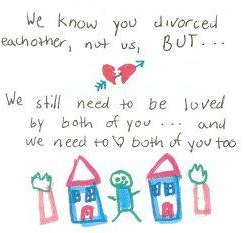 In a parental alienation situation it is detrimental to have such flexible arrangements. It will undermine one parent completely, but of course the lack of flexibility is not something a teenager will be happy with, when they can see their friens having much more flexible arrangements. Thanks Kat. It is striking that a point so often missed is that children who’ve really suffered at the hands of a parent almost always want to maintain a relationship with that parent. These are the circumstances where supervised contact; sometimes very strictly controlled, are required to ensure it’s still possible. Courts (and other agencies) sometimes go to great lengths to facilitate this safely for children. When it’s apparent, even in those circumstances, that this is so important for the welfare of children it’s rather remarkable that in other circumstances it becomes a less significant consideration. As you say, some of these signs are so striking that they ought to be picked up very early on in the process. That requires more awareness and some training, but early identification and careful management of these cases is crucial for the future welfare of these children. It is common for one parent to claim they’re doing all they can but that the child simply refuses to have anything to do with the other parent. “Children should never be forced ..” is the implication that often goes along with that, and is sometimes accepted too. Yet coercion of various outright and subtle kinds is an everyday part of family life as parents ensure their children are cared for and come to no harm. We don’t stand back and allow them to poke things into power sockets nor do we accept their resistance to dental or medical treatment. No-one wants to see brutal enforcement of contact but strong encouragement and persuasion and even skillful coercion are sometimes necessary given the far reaching consequences for children if this important decision is to be made with the necessary care by the adults involved. Even, perhaps especially, with teenagers there are a great many things we have to do to guide them and sometimes to prevent them from making mistakes, in the full and certain knowledge that if we don’t they’ll blame their parents later for not having intervened. On the other hand, some parents are quite clear they’re not prepared to encourage their children differently. I’m aware of a case where a parent; when asked by the judge if there were any small steps that might move the child towards a more positive view, answered immediately with the somewhat intellectual response that to do so would betray the trust the child had placed in them as a parent. In the next post I’ll explore the much less well publicised issue that gives rise to these situations. I’d really value your contributions to that further discussion. 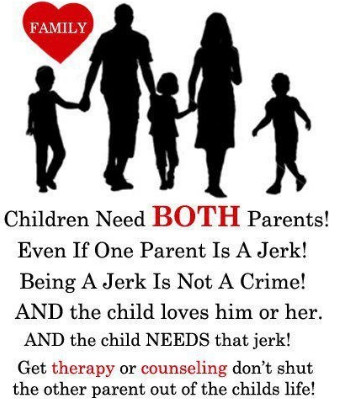 It just baffles me that judges, lawyers, and social workers just accept the child’s refusal see the non-custodial parent, and do nothing about it. Who is looking out for the child here? You think it would never happen, but it does, repeatedly, across the country, without a second thought. I consider those who take this position as contributing to the emotional abuse of the child. Please share. And thank you for all who serve. To lose a parent through alienation absolutely can be more difficult and unnatural than to lose a parent through death, due to the confusion and lack of support for grieving, among other things. In addition, the child is in the custody of an alienating parent, then this means that s/he is in the care of an unhealthy adult.